When Kim takes up motorcycling and Craig wants to try skin diving, Lucy attemps reverse psychology to get them to give it up. Lucy threatens to take up skydiving. Lucy is all of a sudden forced into actually doing taking up skydiving when the kids support her adventure. Harry also insists that Lucy really take it up as it will give the Employment Agency a real boost! Special Notes: To simulate Lucy skydiving, an apparatus is built outside the sound stage. 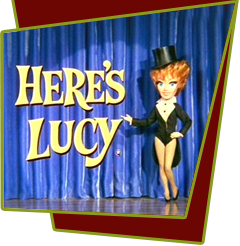 Lucille is strapped by her feet onto a high platform, her lower body in a brace. The apparatus can move in any direction, making it appear as though Lucille is moving through the air. A large theatre fan blows air at her while she moves about as if she is falling. The camera films her from beneath, just keeping her upper body in the frame.